We all need a little help from our friends, as the Beatles remind us, and we all reach out for it from time to time. The same holds true in our yoga practice, and that support often comes in the form of props. Most people think props exist only to help stiffer or less experienced practitioners, but, in fact, advanced students gain invaluable benefit as well. The ability to move deeper and smarter often happens when we can slow down enough to notice the subtleties in an asana. We all experience challenges on the mat, and props allow us to extend beyond our physical (and mental) limitations with intelligence and greater ease. Using a prop helps us stay in a pose longer, and allows the body to release tension—and the muscles to stretch a little more—without worrying about balance or strength. We can experience the healing effects of a pose in a safe way and explore specific actions, aligning the spine or opening the chest more. Most people think props exist only to help stiffer or less experienced practitioners, but, in fact, advanced students gain invaluable benefit as well. Patanjali reminds us that asana should be steady and comfortable (sthira sukham asanam). To find that ease, we sometimes need a little alambana—a Sanskrit word meaning “to depend or lean on.” Alambana may sound familiar; that’s because it shows up in pose names like salambana sarvangasana (supported shoulderstand), which literally means “with support, all-limbs pose,” while nirlamba sarvangasana indicates an unsupported version. A prop can be any object that helps stretch, strengthen, relax, or improve body alignment and balance. Besides the blocks, straps, bolsters, and blankets found in most yoga studios, you can use walls, doors, stairs, tables, chairs, poles, balls, and even your kitchen counter: whatever helps you access the parts of your body that need attention. My prop of choice these days is a thick wooden dowel or broom handle. I use it to explore the proper alignment of my torso, head, and neck; it helps me avoid neck strain and compression. It works particularly well for people who have scoliosis or sacroiliac issues because it can help them notice—and work with—spinal or pelvic rotation. My prop of choice these days is a thick wooden dowel or broom handle. Dowels come in different diameters, so make sure you choose a size and strength that supports your body weight and fits comfortably in your hands. I prefer a 5-foot (or longer) dowel, 1 1/4 to 1 1/2 inches in diameter (a 5- to 7-inch circumference). Use your dowel to create support and stability in your poses as well as to gather information about your posture. It can help you get more lift in your chest in standing poses like utthita trikonasana (extended triangle pose), utthita parshvakonasana (extended side angle pose), virabhadrasana I and II (warrior I and II poses), or twist and lift your spine a little more in revolved poses like parivritta trikonasana (revolved triangle pose) or parivritta parshvakonasana (revolved side angle pose). This lifting and opening action prepares you for pranayama and helps you check your alignment, both in the front-back plane and the left-right orientation. Play with the dowel, substituting it for straps, blocks, and even the wall in any pose you choose. Don’t limit yourself to the ideas I offer here—use your imagination to discover what can support your body and enhance your own self-awareness. Brahmadanda, the great staff of Vasishtha, represents all of the ascetic’s power and strength. In the great battle against Vishvamitra, Brahmadanda shows us that true power comes from tapas (discipline, practice), satya (truth), and ahimsa (nonviolence). Vasishtha conquered his own anger and desire and became a guide to impart knowledge to others. 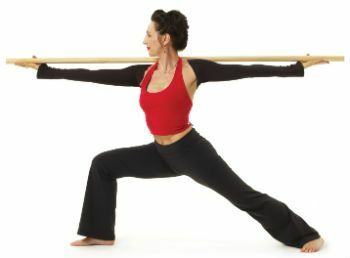 Use the dowel as a reminder to unveil the transformative and healing powers of yoga. Using a dowel in utthita trikonasana can help align your arms and legs front-to-back and side-to-side, and it can give you a sense of stability as you extend out through the side waist. Clasp the dowel behind the torso to open the chest and support the head and neck. Hold the dowel to extend the arm fully while moving into the pose. 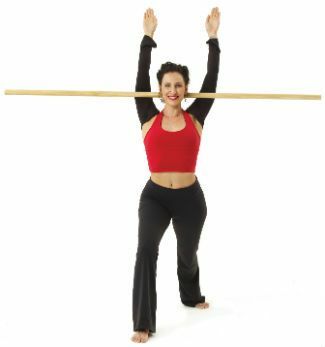 Simply hold the dowel in both hands as you raise them overhead to align the shoulders in one plane. For a deeper shoulder-opener, place the dowel across your neck and underneath your upper arms as you raise your arms overhead. Try holding the dowel behind you and under your arms to keep your arms and shoulders level. Or you can place the dowel at the top of your shoulders and, with your palms facing the ceiling, stretch your arms out along the pole. Using the dowel in parivritta parshvakonasana can give you the stability you need to get more opening in the chest. To work on proper alignment—and to open the chest further—hold the dowel with both hands, place it on the outside of your front leg, and twist toward it. This also works well in parivritta trikonasana (revolved triangle pose). Using a dowel and a belt in pashchimottanasana will help you keep your feet from turning in (pronation) or splaying out (supination). Wrap the belt around the top of your feet and around the dowel and gently pull your torso forward. Uttanasana (standing forward bend): Place the dowel under the ball of your foot for a nice calf stretch. Supta Padangusthasana (reclining big toe pose): Use a dowel instead of a strap to check the alignment of your lifted foot. Sukhasana (easy seated pose): Place the dowel behind your back and in the crook of each elbow to help lift your chest.